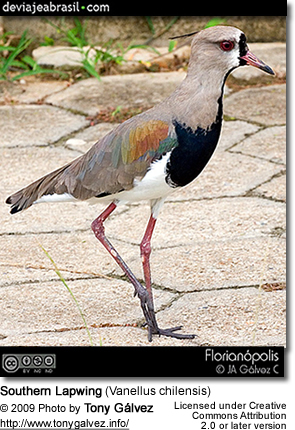 The Southern Lapwing (Vanellus chilensis) is a wader in the family Charadriiformes. It is the national bird of Uruguay, where it is called tero. Due to its bold and pugnacious nature it has become the namesake and mascot of the Uruguay national rugby union team, Los Teros. In Brazil it is widely known as quero-quero, an onomatopoetic of its commonly heard voice. It is a common and widespread resident throughout South America, except in densely forested regions (e.g. most of the Amazon), the higher parts of the Andes and the arid coast of a large part of western South America. This bird is particularly common in the basin of the River Plate. It has also been spreading through Central America in recent years. 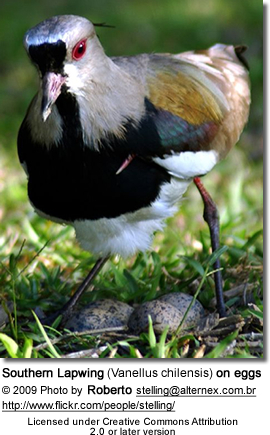 This lapwing is the only crested wader in South America. It is 32 to 38 centimetres (13 to 15 in) in length and weighs approximately 425 grams (15.0 oz). The upperparts are mainly brownish grey, with a bronze glossing on the shoulders. The head is particularly striking; mainly grey with a black forehead and throat patch extending onto the black breast. A white border separates the black of the face from the grey of the head and crest. The rest of the underparts are white, and the eye ring, legs and most of the bill are pink. It is equipped with red bony extensions under the wings (spurs), used to intimidate foes and fight birds of prey. There are three or four subspecies, differing slightly in head coloration and voice. Vanellus chilensis fretensis from Patagonia is sometimes included in the nominate subspecies V. c. chilensis. The northern subspecies - V. c. cayennensis from north andV. c. lampronotus from south of the Amazon River - are sometimes separated as a distinct species, Vanellus cayennensis. These two subspecies have a browner head - particularly the northernmost birds - and the white face band (broad in the northern and narrow in the southern one) does not reach to the center of the crown. However, birds from the general region of Uruguay apparently intergrade. 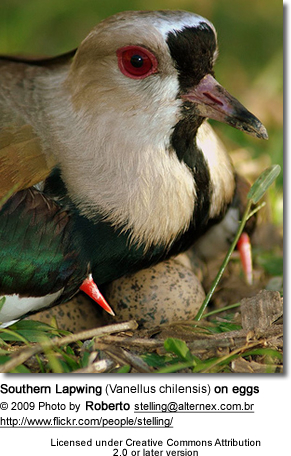 This is a lapwing of lake and river banks or open grassland. It has benefited from the extension of the latter habitat through widespread cattle ranching. It was first recorded on Trinidad in 1961 and Tobago in 1974, and has rapidly increased on both islands. Tends to appear in any area where there are grass spreads, even in urban areas: in Rio de Janeiro, it can be seem even at soccer fields. When nesting in the vicinity of airports, poses a threat to the safety of aerial traffic. When not breeding, this bird disperses into wetlands and seasonally flooded tropical grassland. Its food is mainly insects and other small invertebrates, hunted by a run-and-wait technique, mainly at night. This gregarious species often feeds in flocks. 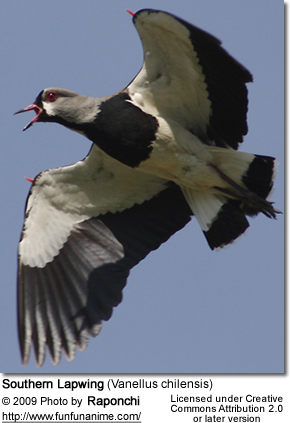 The Southern Lapwing breeds on grassland and sometimes ploughed fields, and has an aerobatic flapping display flight. It lays 2-3 (rarely 4) olive brown eggs in a bare ground scrape. The nest and young are defended noisily and aggressively against all intruders(including humans), by means of threats, vocalizations and low flights. In prehistoric times the species seems to have been more widespread. Late Pleistocene lapwing bones from Florida were initially described as Dorypaltus prosphatus but have since been regarded as indistinguishable trom those of the Southern Lapwing of our time, except by being smaller. Though they may not be specifically distinct, the lack of this birds' occurrence out of South America on a regular basis today suggests that they may be better considered a paleosubspecies V. c. prosphatus. This would have disappeared as the last ice age ended, but biogeography suggests that the species must also have occurred in Central America and/or the Caribbean. 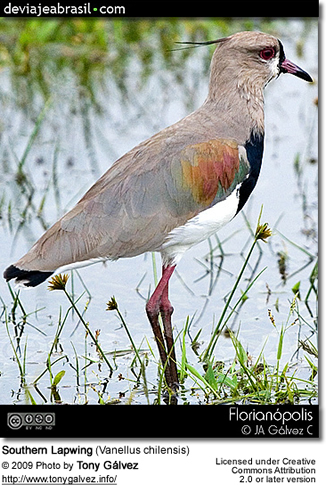 The entirely extinct prehistoric species V. downsi is closely related to the Southern Lapwing found in California; its remains have been found at the La Brea Tar Pits in Los Angeles. Separated by the Rocky Mountains, V. downsi makes an unlikely ancestor to the Southern Lapwing, but it is certainly possible that it was a northwestern sister species.